It is hard to fall off. I think that only nylon is better. This review is about item#7560996. Commodity was safely reach. Thank you very much. Commodity was safely reach. Thank you very much. It is a solid product. This review is about item#120776. Although I bought it as 160 - 240 - 320, I used it comfortably Since one deep scratch comes in at the stage of 320, the scratch can not be erased by the following procedure and 320 can not be used. I think it was a bad individual difference, but it was disappointing. Rather than purchasing at home center, we have a lot of product lineups, the price is cheap and I am very satisfied. It would be greatly appreciated if the price was discounted by purchasing a set. Used to drop rust and old paint. From the conclusion, workability was bad. I got to buy a wire brush type on the way to a nearby home center. Is it about polishing for thin rust? 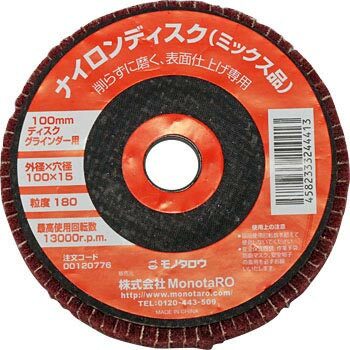 I used the other company's nylon disc found at the home center for the first time and I was surprised by the effect and searched for it with a monotaro. Because it was cheaper than the things of other companies I bought for the first time, I was worried about durability, but it is more durable than other companies' items and I am satisfied. It can be taken cleanly, but it was ragged in one go. It might be better to reinforce a little more outside. This time it was used for the first time. I could polish better than I imagined, and the life was long. I thought that it was quite good. This review is about item#00120785. Durability and finish as expected. It is likely to be finished clean if you change the count.